FIBERLOGY FIBERWOOD 1,75mm - natural it's a wood-like material, which thanks to its lower brittleness enables better feeding of fi lament to the extruder. The resulting elements can be machined, painted, varnished and colored, which gives even more possibilities for using this filament. The appearance of prints allows you to use it in art studios and modeling. GT2 6x2mm timing belt reinforced fiberglass. 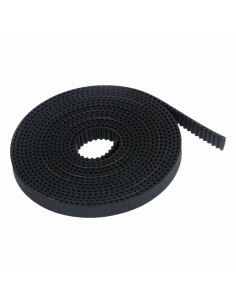 High quality polyurethane timing belts with fiberglass reinforcement for linear motion. GT2 6x2mm timing belt with steel cord.High quality polyurethane timing belts with steel reinforcement for linear motion. Because this timing belt is reinforced with steel you are ensured a low-maintenance high-quality product. You can use it for long XY axes, he is very resistant for temperatures. ABS material is a real strength specialist. The prints that arise from this filament are characterized by high hardness and impact resistance. FIBERLOGY Easy PLA navy blue is a filament that you will get very good quality of prints, and avoid problems when printing.